Annunciation Monastery’s corporate ministry of sponsorship is exercised through the Sponsorship Council. The role of the council is to ensure that the Benedictine values and legacy are integrated into the mission and culture of our sponsored institutions: CHI St. Alexius Health in Bismarck and Garrison and the University of Mary. 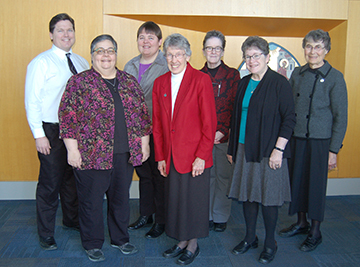 The membership of the Sponsorship Council was recently changed to five sisters and two lay members. The council held their first meeting on January 29. We pray for our Sponsorship Council, the employees and associates of our sponsored institutions, and those served at these institutions.